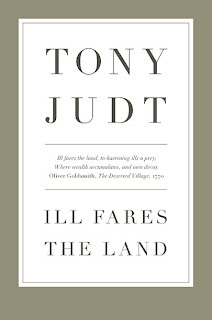 It's the second book by Tony Judt I've read and for the second time, I'm disappointed. I need to either grow into his writing, or not try it again. 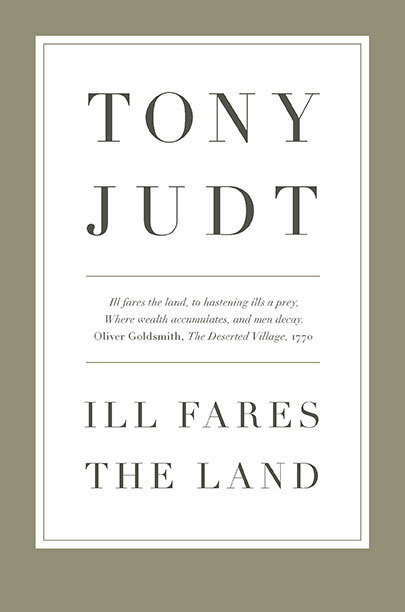 Ill fares the land - what a magnificent title! We all know that the land, understood here as our global village, does not fare well. I bet each of us could offer a recipe for improvement, and some of them would even be worth hearing. Frankly, I expected an intelligent rant. I got a history of political doctrines. Ouch. Funny thing, I dismissed the whole book as boring and useless and yet I noted down a few quotes which I judged too wise to forget. I agree with many of Judt's sentiments. I wholeheartedly agree that we should bring ethical standards back from the attic and give them a thorough dusting. I'm all for the idea that we should re-think our definition of 'worth' and stop translating 'value' to 'money'. I agree with so much of this book on ordinary, human level! Unfortunately, sentiments are overshadowed by political theory. I guess there are people who enjoy discussing -isms. People who believe that an existing system can be an answer to the land's illness. In Judt's case, it is social democracy that is supposed to cure the malaise. It could be worse, I guess. Still, when I read a book, I don't like to feel as if I were attending a pre-election publicity meeting. Whoever the candidates are. How about this - let's wave a magic wand and remove predatory instinct from the soul of homo sapiens. Can't be done? Then the land will keep on faring ill, whatever -ism you apply as a medicine.